1. 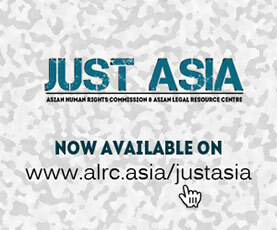 The Asian Legal Resource Centre (ALRC) wishes to bring the attention of the UN Human Rights Council to Indonesia’s dismal standard of punishment for summary executions. Perpetrators are merely sentenced with light punishment, and, moreover, police are generally reluctant to investigate cases of torture and murders involving the Anti-Terror Police Unit (Detachment 88). In addition, the Indonesian government has yet to show serious commitment to prosecute past cases of extrajudicial killings, such as the murder of Munir Said Thalib, the killing of labour activist Marsinah, as well as numerous extrajudicial killings that have occurred in conflict areas, such as Papua. 2. The ALRC’s sister organization, the Asian Human Rights Commission (AHRC), documented the light punishment given for the murder of environmental activist Mr. Jopi Teguh Lasmana Peranginangin (AHRC-UAC-035-2016). Jopi was stabbed to death by navy personnel on 23 May 2015. The perpetrators consisted of more than five people, but the Navy Military Police (POMAL) only indicted one person as a suspect, Private-in-Charge Joko Lestanto, a member of the Marine Corps’ Amphibious Reconnaissance Battalion. On 11 April 2016, the Military Court II 08, Jakarta, convicted and sentenced Joko to two years in prison and dishonorable discharge from the Navy. 3. This sentence, far from public expectation, does not reflect a sense of justice at all. Indicted by Article 338 of the Criminal Code, the maximum penalty was for 15 years in prison. The Navy Military Police investigators were not able to explain why the other actors were not included in the indictment. Similarly, the Military Prosecutor did not respect the fair trial principle in the prosecution of this case. 4. The AHRC also documented and reported the case of Mr. Siyono, who was tortured to death on 10 March 2016 by Densus 88 in Klaten sub-district, Central Java Province (AHRC-UAU-008-2016). Siyono was arrested at his home and died a day later. Independent autopsy results showed that Siyono died from torture injuries. Moreover, after Siyono’s death, the police were reluctant to conduct an investigation into the case. Instead, the police gave IDR 100,000,000 to Siyono’s wife, as “aid to the family”. Furthermore, disrespect was shown by a Parliament Member over the case; Mr. Ruhut Sitompul stated that there was nothing wrong with Densus 88 and there were no violations of human rights, “unless monkey’s rights” are what was being spoken about. 5. Meanwhile, various cases of extrajudicial killings have not been addressed in Papua, for instance, the death of five students shot by security forces in Paniai Regency. Although a National Commission on Human Rights (Komnas HAM) investigation team was established for this case on 7 May 2015, till now the team has yet to begin investigations (AHRC-UAC-089-2015). Another such case is the killing of the Tolikara local congregation; No investigation has been conducted into the actions of the police officers who shot the congregants (AHRC-UAU-002-2016). 6. There is a lack of consistency by law enforcement agencies in implementing legal and judicial standards in cases of summary executions. In particular, when the perpetrators are from the Military, victims face difficulties to ensure and access investigation results under Law No. 31 of 1997 on the Military Court. Furthermore, Law No. 31 places the burden of proof on the victims. For instance, take the case of Mr. Tengku Yusri, a parking attendant who was set on fire by army personnel at the National Monument (Monas), who passed away on 15 July 2014. Yusri’s family and lawyers had to file a report and provide evidence to the Army Military Police (POMAD). Although finally the perpetrator was tried and dismissed from Military service, the Military investigators and prosecutors failed to delve deeper into the alleged involvement of the Commander in the case. • Urge the Indonesian government, in particular its judicial system, to apply a high standard of law enforcement in cases of summary executions. • Urge the government to ensure continuation of police and military reform, and ensure that any crimes committed by the police or military will be tried under the standard of fair trial. • Urge the government to provide remedies for victims of summary executions, or their families, without undue delay and discrimination. • Urge the government to immediately revise the law on Military Courts and police regulations, and ensure that all are equal before the law. « INDONESIA: What next after symposium on 1965 massacre, Mr. President?